Manganitesof La0.7Ca0.3−xSrxMnO3 have been produced using the hydrothermal method. The influence of the concentration of La, Ca, and Sr on the structural, morphological, and magnetic properties was studied and analyzed. The x-ray diffraction studies showed the occurrence of orthorombic and trigonal symmetries in the crystalline structure, depending on the stoichiometry. X-ray photoelectron spectroscopy studies were performed, showing the presence of the elements La3d, Ca2p, Sr3d, Mn2p, and O1s. In all samples, a deficiency of oxygen was observed and ascribed to hydroxide formation. The FTIR spectra shows the Mn–O–Mn bonds in the stretching vibration mode; on the other hand, a great relative amount of Mn4+ ions that are not included in the manganite phase was observed. Furthermore, morphology analyses developed using scanning electron microscopy showed cauliflower-type microstructures in all samples. 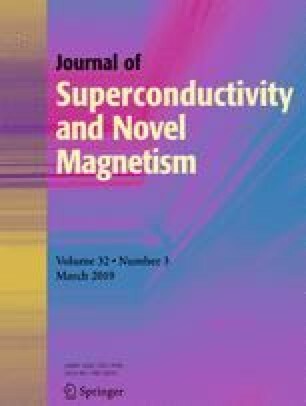 The dependence of magnetization on magnetic field was also studied where a low coercivity and a high-saturation magnetization were evidenced. Values of the squareness ratio coefficient ranged between 0.0587 and 0.0867, indicating that the individual particles exhibit a strong random anisotropy. This work was partially supported by Dirección Nacional de Investigaciones of the Universidad Nacional de Colombia under projects 34085. Support provided by the CODI-UdeA project 2016-10085 and the exclusive dedication UdeA program to one of the authors (JR) is also acknowledged.